This was my #runforboston day. *3 sets of 10 back squats. 35#/45#/45# barbell. *3 sets of 10 wood-chops on the dual cable machine. All at 17.5#. *3 sets of 8 toe push-ups on the medicine ball. First ever doing ALL of the push-ups on my toes! Kind of a necessity since my knees hurt so much from my epic fall on my run on Monday. It was a random workout and didn't go as I had planned. I wrote it all out to be primarily working in the weight room and when I walked in it was packed and everything I needed was in use. Time to improvise! It worked out well, however. I really wanted to use the squat rack to try and lift some heavier weight with my squats, but it wasn't open. Phooey. 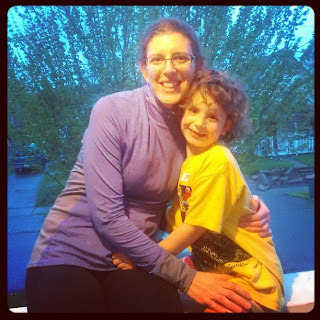 I ran close to 4 miles on my own (the run was supposed to be 3.5 but I did a little extra) and when I got home my 6 year old, Eloise, wanted to go for a run with me. We did almost a mile together of sprinting/walking (do 6 year olds run any other way???). It was so much fun, and I felt really good the whole time, it reminded me of how fantastic my training runs were for my two half marathons last Spring. Eloise and I cooling off on the porch, post run. *5 sets of barbell complexes. One complex is: 10 back squats, 10 bent-over rows, 10 lunges, 10 overhead presses. I PR'd this by doing one set w/ a 35# barbell and four w/ a 45# barbell! It was tough, but I did it! It was an intense, short workout. I think this took me 30-35 minutes total! My friend Tara was visiting from Canada (you might remember her being mentioned on my blog HERE and HERE) and I took her on my favorite local run, up around Alki point along the Puget Sound and Elliott Bay. It was a wonderful long run and the miles flew by as we chatted away and I pointed out some sights. We are perfectly matched running buddies, I miss her so much only seeing her every 6 or 7 months! Tara's husband played photographer for us as we started out on our run. So fun to see you running again, Sybil. :) Also, I was so sorry you fell down. ouch!! You are all so cute.